Our friends in the Melbourne-based ‘Nationalist Alternative’ (NA) attended Sunday’s counter-protest against Islamist extremism. 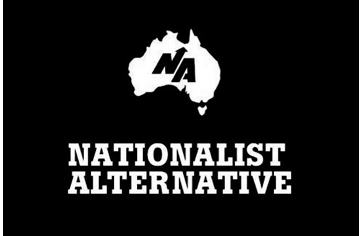 It is a group such as NA which is the better friend of a party like Australia First in defining a new politics rather than any group which still adheres to the failed ‘electoralist’ and ‘mainstreamist’ political models. It is time for such groups to move on. Our members should make an effort to understand these negative concepts in some detail that they may convey our arguments to activists in the declining groups. That our young people coming into the broad nationalist movement reject the old methods can only be seen as positive! Today I attended a rally against religious extremism and Islamist intolerance of freedom speech on the steps of the State Library in Victoria. Traditionally, an event called the Speaker’s Forum has been held there, which has performed the function of a soapbox venue, like Hyde Park in London, in which anyone can stand up and make a speech. Speaker’s Forum started back in the 1890s, on the banks of the Yarra (in what is now called the Southbank district), and featured various socialist, anarchist and suffragette types, plus republicans and radicals. Seventy years later, it relocated to the State Library steps, and here we are. Today’s rally was a response to the outbreaks of Islamist violence, in Sydney and elsewhere around the world (in riots last night in Pakistan, 17 died), which in turn were provoked by the strange film, ‘The Innocence of Muslims’, produced by a Coptic-American, Nakoula, who has a string of criminal convictions for drug-dealing, fraud and the like. Nakoula somehow got his rather amateurish film a cinematic release (back in July, this year) and had posted it on YouTube successfully (without being taken down by the authorities who police these things). Clearly, he aimed at provoking a reaction – and succeeded. Just as September 11 was designed to provoke a reaction from the Americans (who would, when provoked, engage in an unwinnable war in Afghanistan), ‘The Innocence of Muslims’ was designed to push Islamists into rash, precipitous action – action which would, in short, make Muslims look like an aggressive, intolerant, violent, angry and destructive people. (Just today, the Pakistani railway minister placed a $USD100,000 bounty on Nakoula’s head). Nakoula has done more damage to the global Islamic brand name, in the space of a few weeks, than Geert Wilders, Nick Griffin or Pamela Geller have done in years. I will say, from the outset, what Nationalist Alternative’s position is: we don’t support the anti-Islamics, the Breivikists, the Griffinites, the likes of Geller and Wilders. My own belief is that Nakoula must have received funding and support from the professional anti-Islamist activists – e.g., Pamela Geller – who are in turn serving the interests of militant pro-Israel Jewish-Americans and the State of Israel itself. I don’t have any direct evidence of this at this point – right now, I don’t think anyone does – but I see a close fit between Nakoula’s ideology, and tactics, and that of the Breivikists – who are firmly tied to Israel. What’s clear is that the West – and that includes Australia – is being used as a battlefield between two contending ethnic and religious minorities, both of whom belong to (what Spengler called) the Magian Culture, that is, the Arabic-Semitic civilisation. (We white Westerners, on the other hand, belong to the Faustian, or Western, Culture, which started over 1500 years ago with the founding of the Holy Roman Empire). Israel hopes that America (and Australia) will go to war with Iran for Israel’s sake; Benjamin Netanyahu is playing the same role as the first president of the future state of Israel, Chaim Waizmann, did back in the 1930s, with Waizmann’s constant agitations for war between Britain and Germany. (Waizmann found his tool for this purpose in the person of Winston Churchill: it’s the Romneys, Obamas, McCains and Gingriches who are today’s Churchills). We in Nationalist Alternative are the anti-war and anti-violence party. So I attended the rally today, to protest against creeping Islamism (in Australia and elsewhere in the West) and the Islamist colonisation of the West; but also to draw the attention of the participants against Israeli and Breivikist manipulation of popular feeling against Islam. Before the rally started, I had been concerned, by news reports on Friday, that two Australian men in Sydney had been arrested for ‘inciting violence’ against Muslims via text message. This, to me, suggests that Australia is descending (just like Britain) to the level of a police state, in which people can be arrested for a mere text message. At any rate, I judged the news reports of an upcoming anti-Islam rally this weekend, organised on Facebook, to be false. I had seen Facebook postings advertising the rally on TV (on ABC and SBS television), but didn’t give them much credence: I speculated that it was operatives in the Australian government itself which had concocted bogus Facebook postings, with the intent of luring people to attend a phony anti-Islam rally that never existed in the first place (the intention being to gather information, and conduct surveillance, on anyone showing up). But fake rally or no, I was going to do my bit and attend a real rally, at the State Library this Sunday. According to the news, Muslim groups had cancelled a planned anti-Nakoula rally scheduled for Sunday. Why? The authorities had placed pressure on Muslim leaders to call it off. But, in addition, the reaction of the liberal establishment here in this country to the Sydney disturbances the week before had really stung a few senior Muslim leaders, I think. Politicians, media commentators, senior police, called the protests ‘disgusting’ and accused ‘criminal elements’ of making up the majority of the protest group; they were treating it as the most barbarous thing in the world. But to Pakistan last night, there was no comparison. All I saw in Sydney were a few protestors getting in scuffles with the police – which was no worse than the CFMEU scuffles with police at the Grocon building site in Melbourne a couple of weeks prior. But, evidently, a few Muslim leaders realised that, by protesting today, and calling for the beheading of Nakoula, etc., they’d only be playing into the hands of the Breivikists and doing exactly what Nakoula wanted them to do. On top of that, SBS news said, on Friday, that Muslims didn’t want to attend a rally in Melbourne for fear of being attacked by ‘white pride groups’. Which is ridiculous: Muslim attendees could outnumber any counter-demonstrators 30 to 1 (and the men in nighties and beards can, I’m sure, put up a good fight); what’s more, there aren’t any ‘white pride groups’ in Melbourne, or Australia, for that matter. I showed up early with a few patriots, concerned young nationalists from all walks of life. My strategy (if it could be called that) before going to the rally was one of a united front: like the communists in Spain in the 1930s, I would be prepared to work with any individual or group, nationalist or non-nationalist, who would attend the anti-Islamist rally. All would be welcome to attend, and I wasn’t going to turn my nose up at anyone. In this instance, I wasn’t going to be a purist, and reject anyone for not agreeing with my views a 100%. In truth, we at the rally needed numbers to make an impression on the Australian public, and by being ultra-pure (in this instance), I would only succeed in alienating people. This sounds like common sense, but a good many nationalists don’t understand this – Nick Griffin, for instance, who alienated the old British Far Right by labelling them “Nutzis” and cranks (simply for their suspicion of Israel) and refusing to work with them. Griffin would have done far better by building bridges between all the British nationalist groups. I was determined, as a nationalist activist, not to repeat his mistakes. Finally, the storm broke: reinforcements arrived. A small group of militant atheists and secularists showed up, waving placards. At once, several dozen journalists got up and run over to them, taking photos and asking questions. The intense police and media focus was placed on them instead. The atheists were more than happy to talk to the media and give statements. Some of the nationalists knew one or two of them, but generally, the atheists didn’t want to stand near us or talk to us, unfortunately. They weren’t afraid of offending God, with their denials of God’s existence, but they were afraid of associating with Australian nationalists. Then another contingent showed up: surfer types, waving Australian flags, wearing Australian flag capes, and some carrying large laminated placards (which were beautifully done). I personally hadn’t met some of these individuals before today – possibly they were the Facebook-inspired attendees. Their presence, to me, was very welcome. Being in the media and police pressure cooker is an intense experience, and very uncomfortable (it’s not for nothing that the British police call their method of crowd-control ‘kettling’), and it was good to have others there to share the burden. (While all this was going on, various passers-by and gawpers were coming out to look at us, or just to visit the library, or sit on a park bench. At one point, a hipster-fellow got up on the steps, right next to us, and started playing a ukulele). Simply put, the police, the media, and many members of the Australian public, don’t want you to be politically active and call attention to yourself, and express your beliefs, at a demonstration: it’s as though they’re shouting at you, ‘GO HOME!’ or ‘SHOP INSTEAD!’. (Which isn’t to say that quite a few interested Australians did come up and engage with us, in conversation, as to what our beliefs were. Traditionally, it’s the Left – conspicuous by their absence today – who dominated that public space; these interested people were surprised, and pleased, that nationalists had actually shown up there). I felt as though I had shown up, to the battlefield, with one lone battalion, and had to defend an entire sector with that one battalion. Now, two more showed up. I became a lot more relaxed, and sauntered around the battlefield, like a Wellington or Rommel, watching events unfold. Where were the Muslims? They stayed away. One young Muslim couple sauntered by, and gave a statement to the media, and then left. But, on the steps, one (!) lone Muslim activist got involved an argument with a few Australian patriots – an argument which lasted for thirty minutes. Unbelievably, fifty journalists converged on one spot, and swarmed – literally swarmed – around the debators, poking cameras, phones, microphones. The crowd of journalists, circling the debators, looked a cylindrical structure – like a giant bee hive or plum-pudding. It was impossible for me to get through and hear what the debators were actually saying. At one point in the debate, a few patriots gave the ‘Aussie, Aussie, OI, OI, OI’ chant in response to the Muslim debater, who was steadily becoming more and more heated. I saw brows of the police officers furrow: I could tell they were thinking, ‘Shades of Cronulla’. They leaped into action and confiscated the three laminated placards – luckily, this was caught on film. Eventually, the police asked the lone Muslim to leave (to the jeering of the assembled multitude). It was then that a comrade got his P.A. system working on a bench, and straight away, without missing a beat, launched into a speech. This went on for a while, and attracted a little media attention (although not as much as the debators). The microphone was passed on to me, and, without thinking it over too much, I gave a speech – on the topic of Zionist influence and the role of the Breivikists in propagating the Nakoula film. Then the microphone was given to another nationalist comrade, and then another. It was all rather dizzying – I felt like a paratrooper being pushed out the plane door, in a war movie… We all delivered speeches ex tempore. No time to think! After that the show wound down (and it was a show – a piece of political street theatre). We passed around a few cards and fliers, and then left. Later, in the evening, I caught up with the multiple news reports on the rally – in The Age, The Herald Sun, The Australian, SBSNews.Com.Au, and other sources – and managed to catch two news reports, one on Channel 7, the other on SBS.